Thanks to laser pulsing, the 3D Atom Probe is capable of analyzing brittle materials, e.g. multilayer structures with a good throughput. Indeed, the absence of HV pulsing reduces the mechanical stress (fatigue) on the tip and thus minimizes the risk of sample rupture during analysis. Top left image shows a SEM image of a TbCo2/Fe magnetostrictive multilayer. The sample is prepared as a tip by Focused Ion Beam. The multilayer structure is recognizable on the upper part of the specimen. 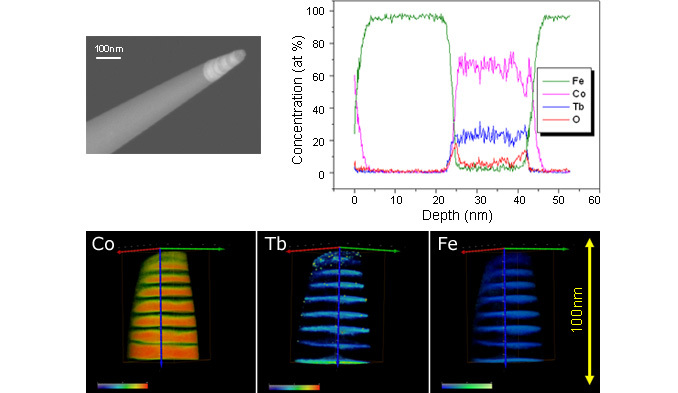 On the right, the concentration depth profile performed along the analysis direction (depth direction) clearly reveals differences between the interfaces (dissymmetrical interfaces): the Fe/TbCo2 interface (1nm thick) is thinner than the Fe/Co interface. This effect is attributed to Fe/Co interdiffusion controlled by the establishment of the Tb layer. Lower row: 3D mappings of Co (left), Tb (middle) and Fe atoms (right) in the probe volume. The multilayer structure of the sample is clearly visible in these 3D reconstructions. Thanks to the unique in-depth resolution of the CAMECA Atom Probe, the 3D reconstruction of the multilayer structure allows the investigation of the interfaces. Analysis localized at nanometer scale revealing local inhomogenities. Data by courtesy of GPM-Rouen University, France.